A Blog Giveaway You Won’t Want to Miss! 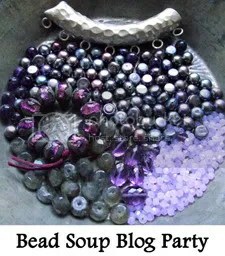 Ahem … in other news, I wanted to take a quick moment and fill you in on a bead blog giveaway that is just too good to miss. You know Lori Anderson, right? She is the generous genius behind most of the super-fun blog challenges that I’ve shared with you over the past year. Well Ms. Lori just got back from the Bead and Button show in Milwaukee and has a fantastic post about her adventure. Best of all, she made a video while there that she shares with us (despite not wanting to). I don’t know about you, but I simply LOVE it when my favorite bloggers put together a video clip. It’s so cool to hear the voice behind the writing sometimes. Of course, don’t hold your breath for me to do something like that any time soon. I think that my WordPress blog has certain limitations in that department (at least the free version I”m presently using). Plus, I’m still not over the little “sound experiment” Isaiah shared with me a few months ago wherein he actually taped me singing to let me hear what I actually sounded like (in a nutshell, horrid). Anyway, enough of me yammering on about the quality of my voice and Mark Wahlberg. Click here to visit Lori’s blog. Go take a look and leave a comment to enter a chance to win some of the goodies she brought back from the show. Her friend Cindy Wimmer is also hosting a similar giveaway, on her blog, so don’t miss that one either. Oh Holy Hannah, that video is going to haunt me! Yes, there is life beyond beads …. Do beads make you salivate, too?